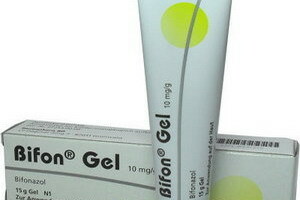 « Homepage / Antibacterial Drugs / "Bifon gel"
Bifonazole is applied for the treatment of fungal infections (Mycosis). These include fungal infections of the skin, nails or hair (tinea), caused by dermatophytes (dermatophytes). In addition, Bifonazole can be applied when the bran mushroom vulpina, with superficial skin infection by yeast fungi (Candida) and Erythrasma, a skin infection occurring mainly in the tropics. Also, infections caused by certain bacteria (of type Corynebacterium minutissimum), which often occur in for acne pustules, are positively affected. Bifonazole belongs to the Group of Imidazoline and Triazoles. The drug inhibits the growth of fungi, fungal skin infections (dermatophytes) and yeast (fungistatic effect), but can also fungal abtötend (fungicides) work in high concentrations. Bifonazole must be applied only once a day. Thanks to its gel form is the medicine for the treatment of hairy skin surfaces. The active ingredient is for external use only and should not be swallowed. Put the gel in the eyes. What interactions of active substance of Bifonazole in Bifon gel are known? It is important to note that the interactions can be different depending on the pharmaceutical form of the drug (for example, Tablet, syringe, ointment). two to four weeks for superficial skin fungal disease. The following information gel in General, pregnancy & lactation, and children about contra-indications for the purposes of Bifon. It is important to note that the contra-indications can be different depending on the pharmaceutical form of the drug (for example, Tablet, syringe, ointment). When Bifon cannot use gel? Bifonazole must not be used with hypersensitivity to the active substance. Bifonazole in infants should be used only under medical supervision. The active ingredient may get into contact with the eyes. Bifonazole should be applied during pregnancy only after careful weighing of benefit and risk by the doctor, because the proof of safety for this time is still not provided. Bifonazole not in the chest area must be applied during breastfeeding. What side effects can the active ingredient of Bifonazole in Bifon gel have? In the following, you learn the most important thing possible, well-known side effects of Bifonazole in Bifon gel. These side effects should not occur, but can. Because everyone reacts differently to medications. Please also note that the side effects in type and frequency can vary depending on the drug form of the drug (for example, Tablet, syringe, ointment). Uncommon side effects: skin irritation (temporarily), redness, burning, flaking, fabric softening. Rare side effects: hypersensitivity reactions (itching, redness, vesicles) against the active ingredient of Bifonazole also beyond the contact (scattering reaction).